The 2012 United Way of Dane County’s campaign got off to a quick start with the annual Days of Caring activities throughout the county this week. 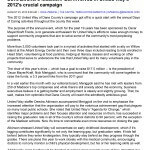 The purpose of the annual event, which for the past 19 years has been sponsored by Oscar Mayer/Kraft Foods, is to generate enthusiasm for United Way’s efforts to raise enough money to support community programs that aim to solve some of the community’s most perplexing problems. More than 3,000 volunteers took part in a myriad of activities that started with a rally on Willow Island at the Alliant Energy Center and then over three days included reading to kids enrolled in Head Start, volunteering at food pantries, helping at literacy classes and working on other projects that serve to underscore the role that United Way and its many volunteers play in the community.